Mixed Salad Annie: Salad. Assembly Required. So you can't cook. Don't worry, there's always salad. Salad is the perfect answer to any cooking dilemma. It can be a first course, the perfect lunch or a light dinner. I love it for all three. I make all kinds of salads. Some are simple chef salads, others might include leftover cooked chicken or meats with cheese, some have beans, tomatoes and crutons, others highlight fruit and nuts and some have a little bit of everything. The photo above was my dinner the other night. I call it Kitchen Sink Salad. It basically has everything but the kitchen sink. It is rarely made with the same ingredients because I just use whatever I have in the fridge. 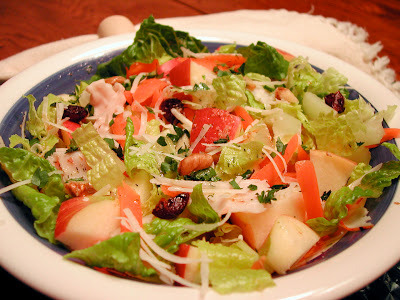 So play around with what ever you have in your fridge and you will find that building the perfect salad is really easy. Use your favorite ingredients or whatever is in your refrigerator. Add all ingredients to a bowl. Add dressing and toss coat all ingredients. Enjoy your creation! Whisk all ingredients in a small bowl and add to your favorite salad. Yum. The dressing sounds like it would also work well with balsamic vinegar. Cube, Yes definately, balsamic would be great too! Mmmmmmmmm...I love salads for lunch! Apples are my favorite winter fruit to add. Claire, I've been on a salad lunch kick for a few months now. I'm surprised that I'm not sick of them yet. I love apples in my salad too, and pears are my favorite.